The Empire’s vile use of the Death Star, enslavement of entire worlds, and wrinkly psychopathic ruler generally don’t make for good examples when it comes to abiding by the law of war. Nevertheless, just like a broken clock, the Empire occasionally gets things right when it fights. 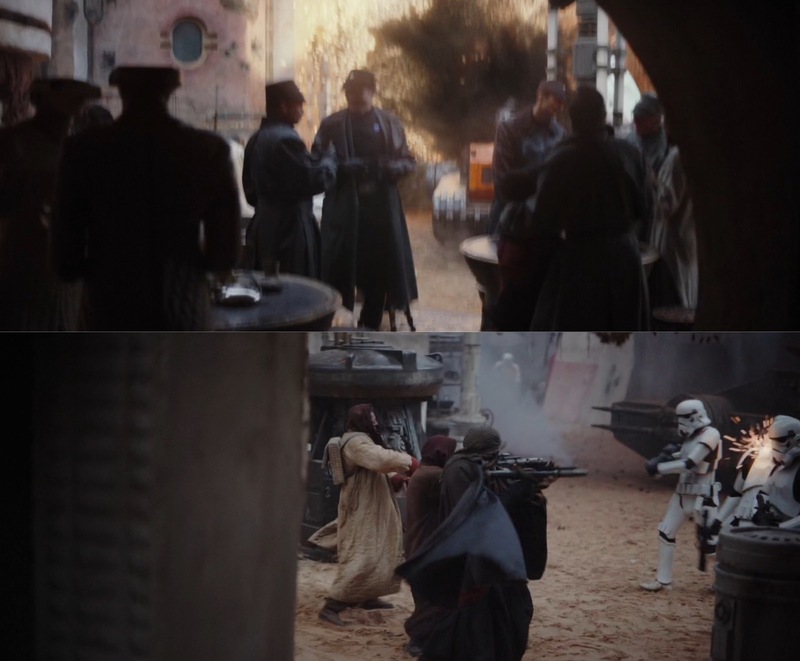 The Jedha City ambush scene from Rogue One is one of those instances where the Empire doesn’t royally screw things up from a legal perspective. With Rogue One’s release on Blu-Ray and DVD today, it’s a perfect time to break down one of the best scenes in the movie and take away some lessons about how the law of armed conflict impacts military operations. Even if you haven’t watched Rogue One in a while (if that’s the case, you should immediately cease reading this article and go rectify that travesty), you probably remember the scene we’re talking about. Cassian Andor and Jyn Erso are on Jedha in search of an Imperial cargo pilot who has defected with possible information about the Empire’s new top-secret super weapon, the Death Star. They soon find themselves caught in the middle of a major firefight, as Saw Gerrera’s insurgent forces ambush an Imperial patrol. 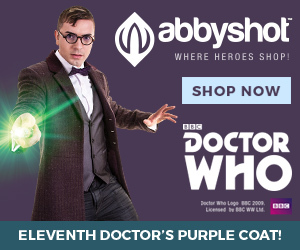 Heavy fighting and general on-screen awesomeness then ensues. 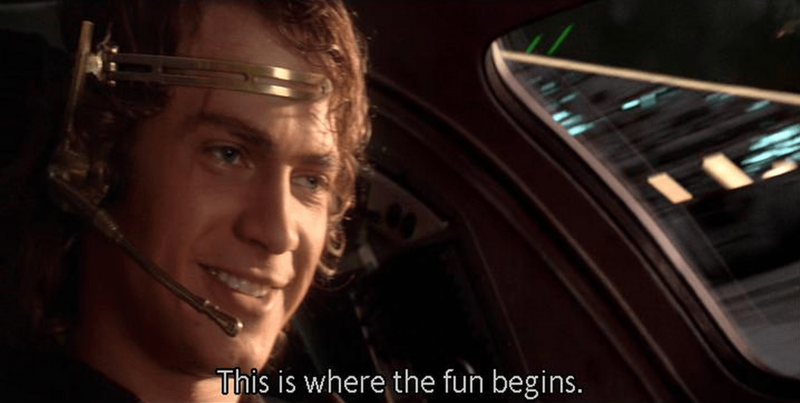 Anakin would have to wait to have his fun until later in the movie when a bunch of Rebel troopers got to see a real lightsaber up close and personal. Gather ’round and let the sweet sounds of Imperial propaganda fill your ears. The Jedha ambush scene begins with a pretty routine Imperial operation. A squad of stormtroopers escorts an Imperial “occupier” assault tank, which is transporting a number of kyber crystals. Of course, the Imperials do so with typical flare, using a loud-speaker to broadcast a message touting the moral high ground the Empire supposedly occupied. There is nothing unlawful about the Imperials’ use of the loudspeaker. Psychological operations, which are commonly known by the shorthand “PSYOPS,” can be legal in various forms. PSYOPS have been around in one form or another for nearly the entire history of warfare, ranging from leaflets to loudspeaker messages and beyond. They are often a highly effective non-lethal way to affect enemy morale or sway civilian attitudes. For example, U.S. forces dropped over 29 million leaflets to Iraqi forces during the first Gulf War in the early 1990s. The leaflets portrayed the futility of resistance, the inevitability of their defeat, and placed blame on Saddam Hussein. After the war, 88% of Iraqi forces said they believed the messages and roughly 70% said the leaflets affected their decision to surrender. 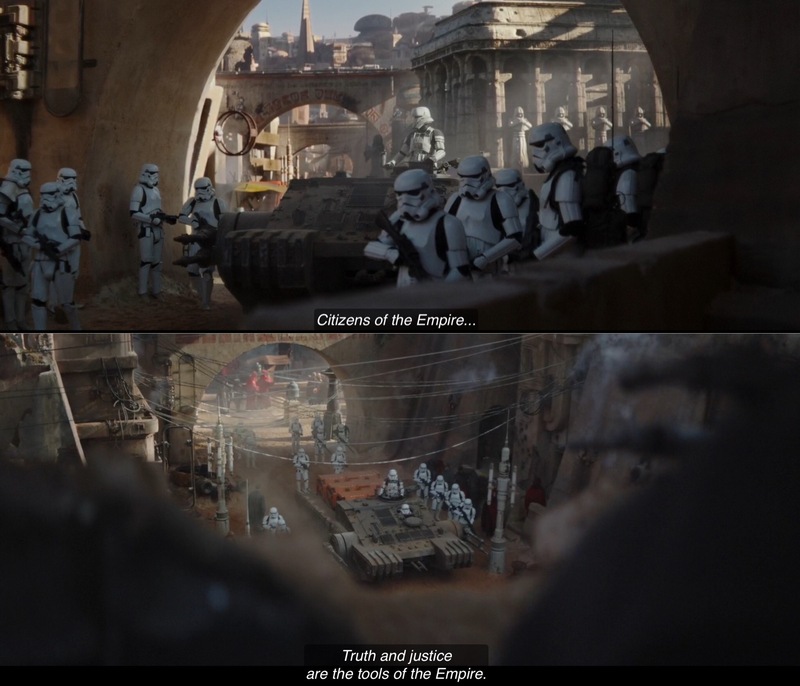 Thus, if the Imperials had Judge Advocates within their ranks, they would have raised no issue about using a loudspeaker to broadcast PSYOPS messages to the denizens of Jedha. As the convoy enters a small plaza, the ambush is already in motion, unbeknownst to the patrol. 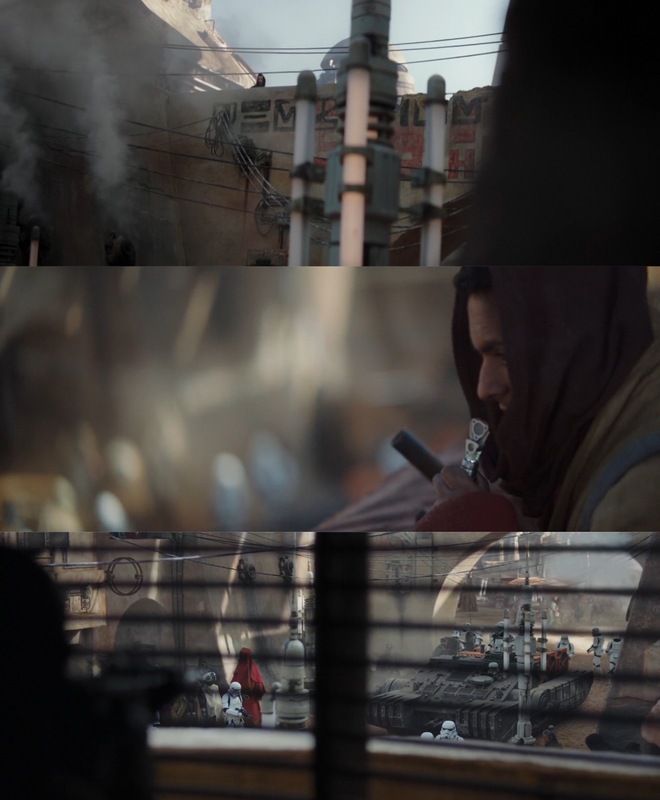 Saw Gerrera’s insurgents employ spotting techniques from several vantage points, observing and communicating information about the patrol. Their actions constitute what is known as “hostile intent.” Hostile intent is the threat of imminent use of force against friendly forces. Although Gerrera’s men were disguised as civilians, their spotting effectively reveals their status as combatants, making them lawful targets. Spotting is considered a demonstration of hostile intent because of its purpose: to gather information about the enemy and facilitate attacks. It is a tactic often used by fighters to gather intelligence on enemy forces. Spotting is also commonly used in ambushes, where a spotter will relay information designed to precisely time the attack. The act of spotting is therefore a precursor to the use of force. That is exactly what Saw’s forces are doing in this scene as they rapidly relay information to coordinate multiple prongs of their ambush. Therefore, the Imperials would not have to wait to be fired upon before attacking. Had they realized what was happening, they could have lawfully fired on the spotters even before the insurgents attacked. Saw’s forces trigger the ambush with a grenade that is meant to surprise and confuse the Imperial patrol. The misdirection works, causing the stormtroopers to be preoccupied with locating the grenade’s source. Saw’s men seize the advantage, opening fire from all directions. The insurgents’ deceptive tactic initially works well, as they inflict many casualties before the stormtroopers and tank can react. At this point, Saw’s men were committing hostile acts—attacks or other uses of force against friendly forces. The insurgents’ hostile acts make them lawful targets. The patrol is within its legal right to fight back against the insurgents. Commanders retain the inherent right and obligation to exercise self-defense of their units in response to hostile acts. This also means that individual unit members retain the right to defend themselves and other members of the unit. Here, that means that each stormtrooper can use deadly force to defend themselves and other members of the unit. The Imperials in the patrol do just that, returning fire with blasters and the tank. However, self-defense does not give soldiers a blank check to use unlimited force. Even in chaotic circumstances, the core principles of the law of armed conflict remain in effect. That includes the requirement to distinguish between civilians and military targets. To their credit, the Imperials maintain their discipline by focusing fire on the insurgents. 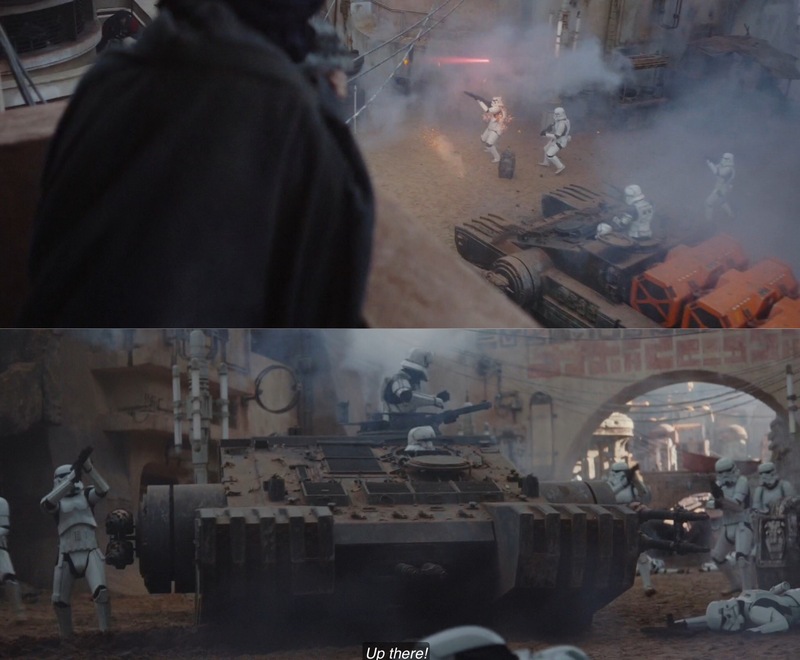 While civilians are caught in the fray, Imperial troops distinguish their targets by returning fire on insurgent positions and not firing wildly all over the plaza. Additionally, the law of armed conflict requires military units to use proportional force in self-defense. That means the nature, duration, and scope of the force should be no more than is necessary to decisively counter the hostile act. This concept does not mean that the stormtroopers on Jedha could only return fire with blasters and grenades. The use of the tank to level the tower was lawful because of how the tower was being used. The patrol was taking heavy fire from insurgents in the tower, which provided excellent cover and concealment for Gerrera’s forces. The Imperials were therefore within their legal authority to fire on the tower with the tank, thereby quickly ending the insurgents’ strategic advantage. As the fighting raged on, the Imperials were eventually reinforced with more troops and an AT-ST. In the real world, the U.S. military coordinates combat operations on different levels. Tactical Operations Centers (TOCs) and Joint Operations Centers (JOCs) are used to ease that sort of coordination. Generally, TOCs and JOCs are the place where a commander plans, monitors, and directs tactical operations. TOCs and JOCs range from a group of connected tents to larger rooms that resemble a NASA mission control center. TOCs and JOCs also play a key role in overseeing combat operations. For example, the JOC might display a live video feed from a drone that is providing surveillance for a convoy below. If that convoy gets attacked, the JOC will likely coordinate or direct close air support from nearby fighter jets. Judge Advocates are usually in TOCs and JOCs, advising commanders on the law of war every step of the way. We see the effects of that sort of battlefield coordination on Jedha. As the ambush unfolded, the Imperial patrol would radio up to the TOC or JOC, which was likely housed inside the Star Destroyer looming over the city. The patrol would have reported “troops in contact,” or TIC. Declaring a TIC, as the practice is known, is an alert that friendly forces are engaged in combat. A TIC often triggers the rapid coordination of reinforcements and combat assets, such as close air support. The concept of unit defense comes into play in situations like this one. Unit self-defense allows friendly forces to come to the defense of another unit. In the real world, that might occur when Apache attack helicopters provide air cover for a pinned down group of infantry. Here, Imperial forces lawfully called in support from an AT-ST and more troops to defend the patrol. Some of the stormtroopers from the original patrol were likely in need of medical evacuation and there were still other troops at risk in the immediate vicinity. The reinforcements ultimately had the desired effect, scattering Gerrera’s forces and allowing the Imperials to regroup. Contrary to their general dastardly reputation, the Imperials actually managed to play by the rules during the Jedha ambush. 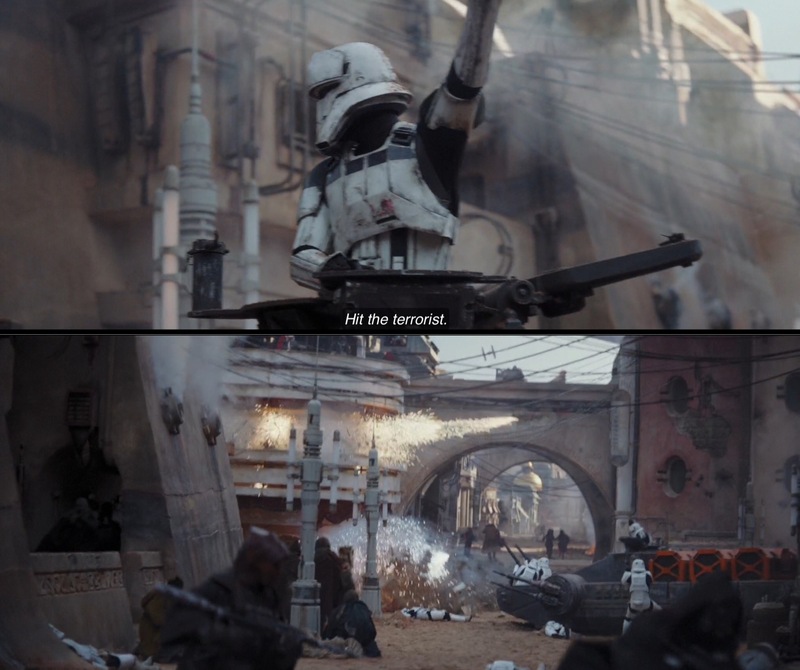 Imperial haters should have no fear, as it wasn’t too long before Director Krennic and Governor Tarkin made sure everyone on Jedha knew what a real war crime looked like by obliterating Jedha City with the Death Star. Previous articleCan the Hand be Prosecuted for Distributing Synthetic Heroin?